A perfect description of the breed. The love and devotion the Groodle has for their human friends is simply amazing. 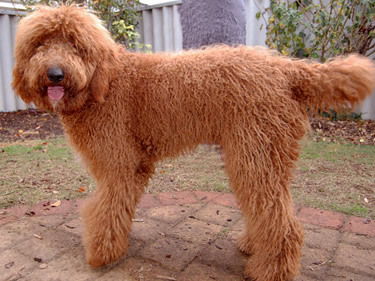 The Australian Groodle was bred to be a companion and guide dog. 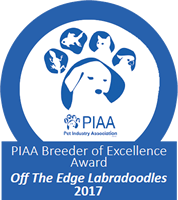 Through diligent breeding practices, always-keeping temperament a top priority, the breed has developed as being one of the smartest most intuitive breeds of all time. A combination of the high intelligence of the parent breeds. You can't buy loyalty, they say, bought it though the other day. You can't buy friendships, tried and true. Well, just the same I bought that too. so all in all, the purchase price was pretty small. Buy a brown-eyed puppy with a wagging tail. The Groodle is very intuitive, sensing when you need extra attention. They know your every mood, and will act accordingly by just being near when you need a friend. Their happy and joyful antics will bring a smile to your face instantly. The breed is very easy to train. They love to learn new things and excel at an amazing pace. Groodles make excellent performance dogs, such as agility, guide dogs, assistance dogs and more. They're unique connection to their human companions make them yearn to be near their people. 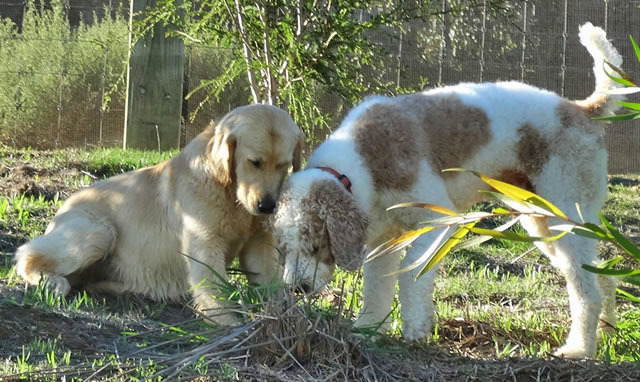 The Australian Groodle is the true family companion breed. 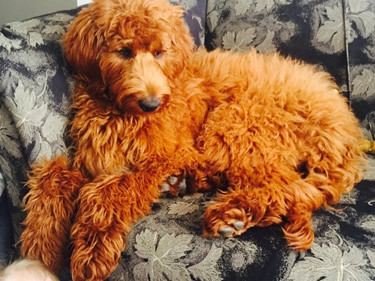 They mostly have an odour free non-shedding coat, making the Groodle the most popular choice for those that are allergic to dog hairs. The non-shed coat means that you will not have dog hair on your furniture, carpeting and clothes. Their coat will require some grooming, you can easily learn to do this, and most folks find great pleasure in doing so. A fun dog to take on outings having to do with water, boating, lake swimming, beach going and such. They have often been reported running through the sprinklers with the children. Their love of water can sometimes lead them to mischief, playing in a water dish, climbing into the shower or tub. Like people, Groodles differ from puppy to puppy. Some will be more mellow, they are happy to be near and do whatever you are doing at that moment. Some are a perfect match for folks with a less active lifestyle, others are very active and busy. It is important that you discuss your lifestyle and activity level with your breeder. The more information you can give the better. 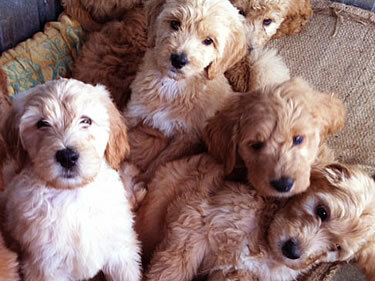 We, as your Groodle breeder, will know which puppy will be the perfect match for your family and lifestyle.